I'm a romantic and believe strongly in the sanctity of marriage. Wedding rings are a special part of this because they are an outward symbol that you have made a lifelong commitment to another. I take exceptional care in crafting engagement and wedding rings as they will be worn everyday and are a constant reminder to those in the relationship and the world that these two people love each other so much that they wish to spend the rest of their lives together. I feel that a lifelong relationship is one of the greatest successes that a human being can achieve. Of course with any great success there is also difficulty along the way. It is my wish that this symbol you have chosen to wear around your finger will give you strength, hope, courage, compassion, empathy and endurance when you are challenged over the course of your marriage. It is always an honor to make a piece of jewelry of such significance. 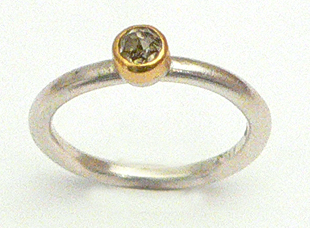 Over the years I have made numerous custom engagement rings and wedding bands for many sweet couples. One of the most gratifying aspects of my career is having the chance to work in person with my clients - the relationships that develop have been the source of much inspiration for me, both professionally and personally. If you can not come meet with me at my gallery I am happy to send images of stones, bands, designs, metals, sketches, and past works. I have made wedding rings from stones passed down for generations, designs that came out of peoples dreams, and river rocks found on a first date. Traditional wedding rings are beautiful - but don't get caught up in the rules - this is YOUR ring. It should be made just for you.